Based on her date of mating we expected Brynja's puppies on Tuesday. At an earlier visit to the vet, he thought she'd be later than that. 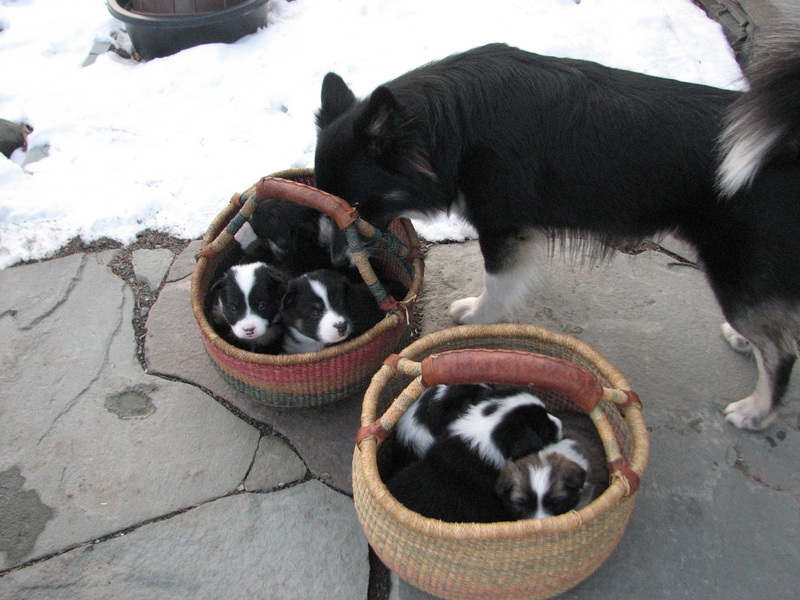 But once she stopped eating Sunday morning and started digging holes in our gardens and hanging out under the pottery benches again, we knew puppies were about to arrive. 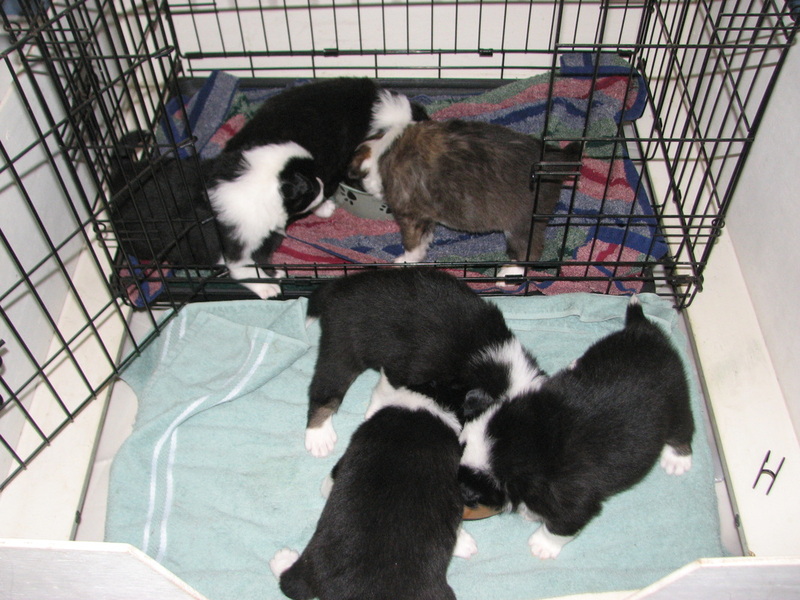 A visit to the vet Monday morning revealed 6 puppies on the way. Monday evening she found her way to our bedroom and clearly wanted to have the puppies in our bed, and wasn't in the mood to be dissuaded. I finally got her to go the whelping box and contractions started shortly thereafter. 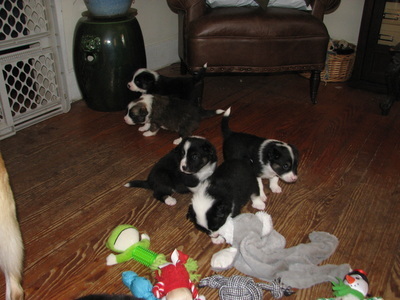 The first puppy was a black and white tricolor female and I could immediately see she was a big puppy, in contrast with the tiny elfin things that came out first round. She weighed in at 11 3/8 ounces and because of her size I gave her the name Bessa (Bear). 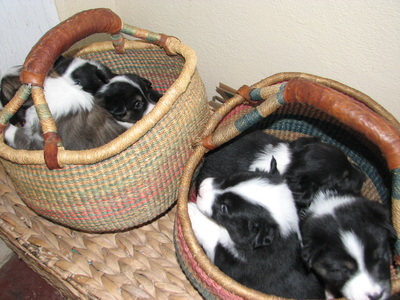 The second puppy was noticeably smaller (9 3/4 ounces), a male, and another tricolor. I thought to myself I could go with "B" names (lots of Icelandic names starting with "B") and continue the bear theme, in this case Little Bear or Bassi because of his smaller size. 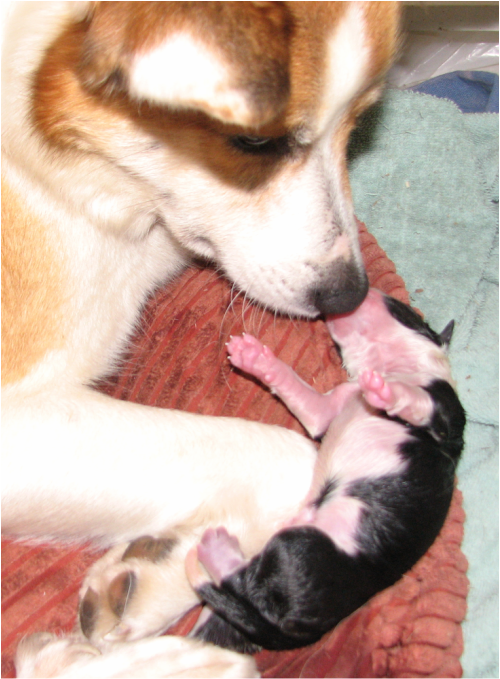 Puppy 3 was a big tricolor male (11 1/2 ounces). I named him Bjossi, a nickname for Bjorn, because I wanted to save Bjorn for puppy 4. When this tricolor male was born, I was a tad worried about him. He seemed a bit lethargic. But he came out of his stupor and proceeded to rampage around the box, crawling and rolling around everywhere, practically going up and over Brynja a few times instead of nestling in with her. Seems he's destined to be a rambunctious, boisterous, adventurous "bear" of a dog. Then came the waiting. I was already tired to start the evening and by 11:30 we were still waiting on two puppies. I passed out on the couch briefly and made it back to the whelping box a little after midnight where puppy 5 was waiting. Another black and white tricolor male. He was the biggest so far (12 ounces) and could easily qualify for a "bear" name, but I decided on Brosi (smile) instead. We've always been impressed with how much Icies smile when they meet you - Brynja in particular - so we'll see if he inherits that trait from his mother. 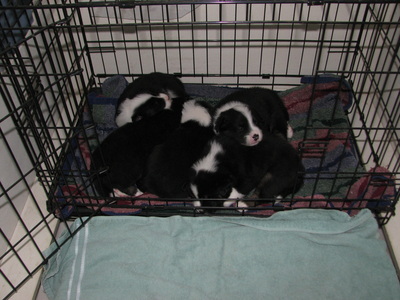 That made four male tricolors in a row and all five of the puppies were tricolors. 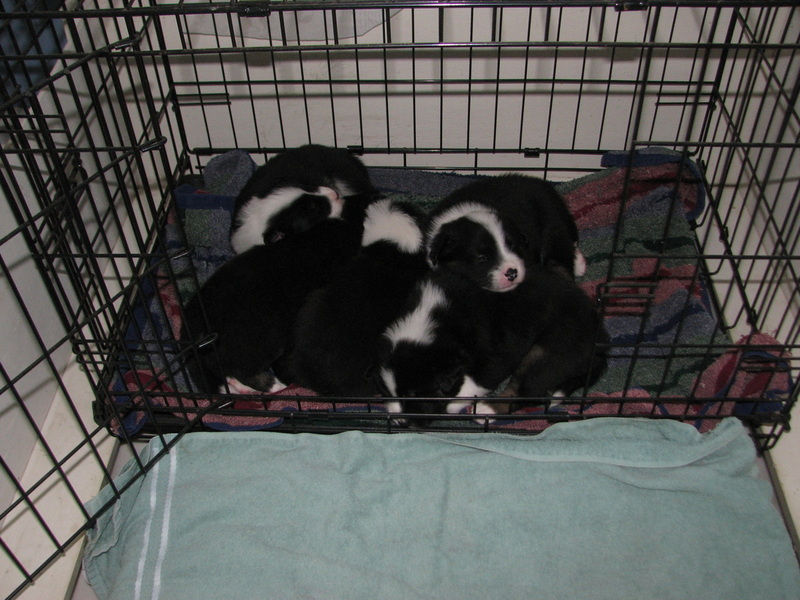 Based on her first litter I was expecting diversity and was a bit taken aback by the seemingly endless stream of black and white tricolor puppies. But there was still one more to go. And this one broke the run: a female that is sure to look like Brynja, who I guess is best described as a red and white sable color. She was another big puppy at 11 1/2 ounces and back to the bear theme I went, coming up with Birna, the female form of Bjorn. Bessa ♀ (Bear) is now living in South Korea with an 11-year old girl, a 7 year old boy and their parents. At 11 3/8 ounces, a big puppy in contrast with Brynja's first litter and the start of the "bear" names for this litter. She really loves people - gets very excited and just can't contain herself when she sees someone new. 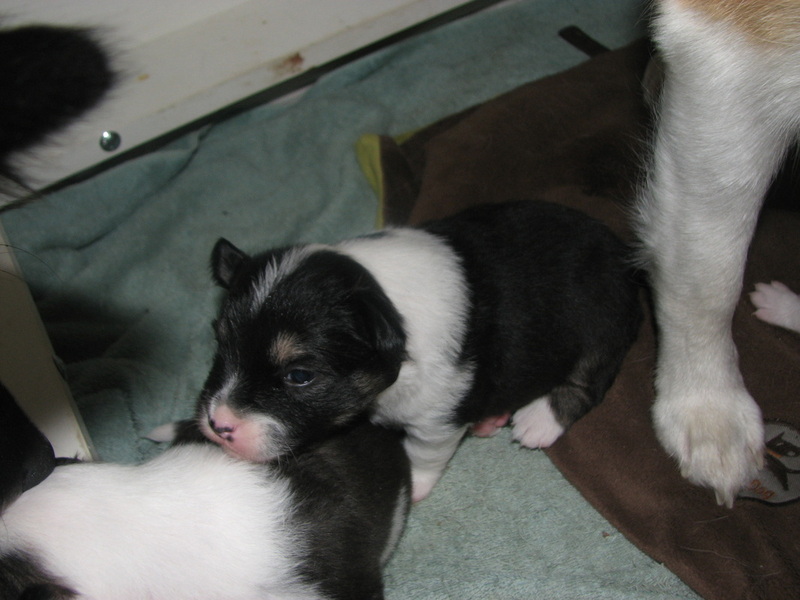 She's going to have a short coat like Brynja - a tricolor version of Brynja. Bassi ♂ (Little Bear) is now living in West Babylon, New York with his owner, her husband and parents, and two Flemish giant rabbits, two cockateils, a hedgehog and a turtle. The smallest of the litter at 9 3/4 ounces (a normal puppy size for most litters), he headed straight for a teat and seemed to be attached there for the rest of the birthing. 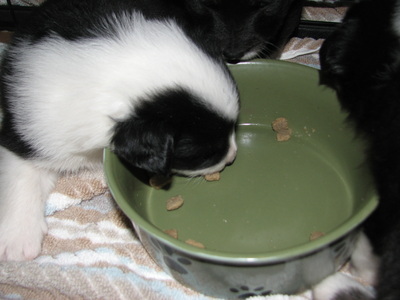 If he continues to eat like that he'll catch up to his brothers and sisters in no time. He's a very happy boy, like his sister very people oriented, wiggling and waggling whenever he sees someone. Bjossi ♂ (nickname for Bear) is now living in Kerrville, Texas on a goat farm that's also a Bed & Breakfast with his owners, two other dogs, a herd of burros, and, of course, a flock of goats. He was the biggest pup at the puppies' first visit to the vet, just a little bigger than Brosi. He's more observant of his environment than any of the other pups, being the first to start noticing birds flying around, airplanes, cars & trucks. He has a bit of an independent streak as well and he's not as focused on playing with the other pups or people. I think he's going to be the best working dog of the litter and we're hoping to find him a home on a farm. He's still very friendly with people, just not as over the top friendly as Bessa and Bassi are. Bjorn ♂ (Bear) is now living in Saugerties, New York with his owners, a 14 year old boy and a 4 year old boy. I think Bjorn is going to be a very handsome boy. He has the roundest head amongst the boys in the litter and will probably have a solid, wide head at maturity. Similar to his brother Alfur from the first litter. Just a nice, sweet, friendly, gentle boy - definitely destined to be more of a "pretty boy" like Galdur than a worker like we think Bjossi will become. He's always coming over to me looking to be picked up and cuddled, so much so in fact that I've started rejecting him on occasion because I don't want him to become too "clingy". 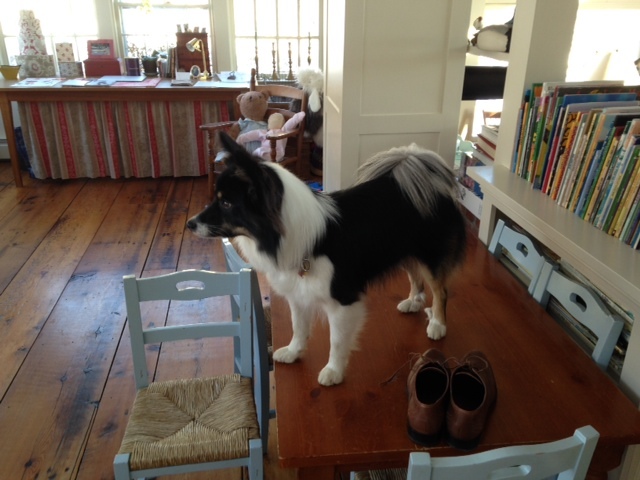 Brosi ♂ (Smile) is now living in Jarrettsville, Maryland with a four year old boy, his parents, another Icelandic sheepdog, a mixed breed dog and two cats. He's the biggest pup and he's built like a tank. Probably the developmental leader as well. He's been on all fours barreling around the whelping box for a while now. He will look the most like Galdur of all the pups in the litter. That early evaluation has stayed accurate. He's figured out how to scale the wall of his pen and has been getting out for a week while the other pups still haven't figured how to get out. He's the most contented of the pups, constantly giving that little yawn/cry that sounds to me like a sound a pup would make when he's very, very happy with his world. Birna ♀ (female form of Bjorn) is now living in Glenburn, Maine with her owners and a chihuahua, a chihuahua/pug cross, 18 chickens to bark at (and perhaps herd) and two acres to guard. Birna is going to have a coat at least as long as Galdur's. I think she'll look a lot like her mom but with a longer coat. She has the most complex personality of all the pups. I alternate between thinking she's worried/she's content; she's aloof/she's friendly; she's assertive/she's playing like a puppy. The answer, at least partly, is that she's changing. She was much more aloof at first and now she's as friendly as any of the other pups. One thing is certain - she doesn't take any gruff from her bigger male siblings. Since Bessa, Bassi and Bjorn have left, it's just been Birna and the two big male pups, and she's holding her own with them. And one other thing is certain - she loves belly rubs! This is a momentous time for the puppies. We begin doing a number of things differently for the first time. We introduce a crate to the former whelping box and try to get the puppies to use it as a sleeping quarters. Weening also starts, the bowls of moistened kibble placed in or near the crate so they begin having positive associations with a crate. 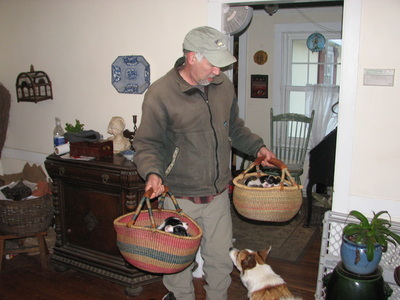 House-training begins - if all are sleeping, we wake them up, quickly getting them into baskets for an airlift outside. 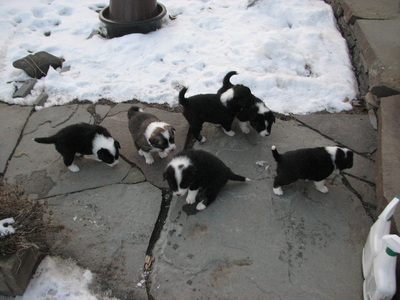 Of course, this is their first time outside as well, though they only stay out long enough to pee or poop. If one or two pups wake up out of sync with the rest they can be hand carried in and out. Finally they start getting a little play time outside their playpen in our living room. Here are the events in pictures. If you want to have a good idea of what the black and white tricolor puppies in this litter will look like as adults, here's a couple of pictures of Varda, from the first litter, as a puppy and at two years old.